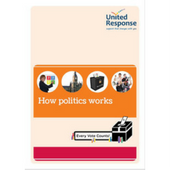 United Response has made 3 booklets to make politics easier to understand. All 3 booklets are written in easy read. There is also a ‘Supporter’s Booklet’ which provides information on how to help someone with learning disabilities get more involved in politics and voting. This booklet is not in easy read. 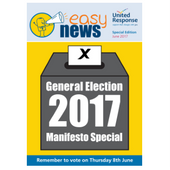 There is also an Easy News Manifesto Special for the 2017 general election. This makes the political parties’ manifestos easier to understand. This is in easy read. You can download all of these booklets using the links below. 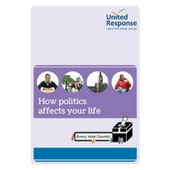 The 1st booklet is called how politics affects your life. It explains some of the ways politics affects your everyday life. The 2nd booklet is called how politics works. It explains what politicians do and how politics works. The 3rd booklet is called how to get involved in politics. It tells you about the different ways you can get involved in politics. This is the Supporter’s Booklet. 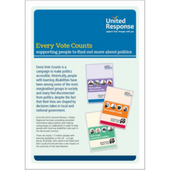 It provides information on how to help someone with learning disabilities get more involved in politics and voting. It covers topics including advocacy, bias and mental capacity. The Easy News 2017 Manifesto Special explains the main points from all the political parties’ manifestos in easy read. You can use it to help you decide who to vote for in the general election on 8th June 2017.